For those of you local to the Cincinnati area, I will be teaching four alterations classes in May. The first two are May 18th, one in the morning and one in the afternoon. The second will be May 20th, also one in the morning, one in the afternoon. For more information, a flyer will be posted on my website, LearningAlterations.com in a couple of days. If you'd like more information, please leave a comment here or on my website. I look forward to helping you learn how to alter your clothes. This client has split the seat of her favorite jeans. This is fairly common these days, given the amount of Spandex there is in some denim fabrics. She knows a seam will show, but is willing to deal with it in order to be able to wear these again. I create the seam in these from the inside. 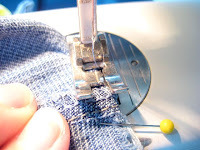 The trick is positioning those first and last stitches as close to the folded edge as possible, as you see in the second picture. It's a lot like stitching a dart. I taper each end of this seam into that folded edge. I don't backstitch, just leave enough thread at the beginning and end. Then I tie those loose threads in a regular knot at each end of the "dart". I actually repaired 4 tears in these jeans. Although the seams are visible, they press flat and will blend in a little when she's wearing them. And they won't show at all when she's sitting down, right? Today I reattached the pocket flap on an overcoat. 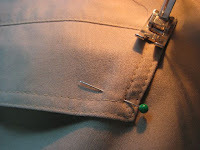 This is fairly easy because the lining on a coat is usually unattached at the hemline. All I had to do was position the machine in between the lining and the coat, then stitch. 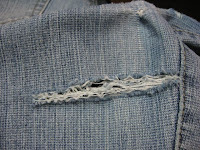 The stitch lines are already there, they are the pocket flap topstitching. I use a smaller stitch to add strength. The button has a reinforcement button on the inside of the coat. The hand stitches that attach the outer button are drawn through to the under side to pick up the smaller button. Since you attach both buttons at the same time, getting them lined up is a little tricky. It takes extra time. When you put buttons on a coat, make sure you leave room to make a shank underneath. It makes buttoning much easier and your coat front will lie flat when buttoned. Today's hem is in a striped jean type pair of pants. They have a little spandex in them which makes the hem go in beautifully. I've used a different technique today. I folded the hem into position, measuring all the way around. After pressing this into place, I unfolded them and marked the cutting line with tailor's chalk. 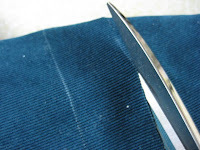 The hem line should be 1"-1½" from the cut edge. 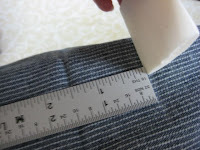 On these pants I did not have to remove the existing hem because the amount to be shortened was several inches. 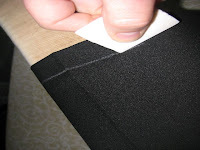 The next steps are actually the same as shortening the lining, as in yesterday's post. I fold on the new hem line and press. After unfolding this on the sleeve board, I fold the cut edge until it meets the new pressed line. Press again. Then I can fold this up twice and my new hem is set. Press this for the threads to retain memory. Stitch ½" to ¾" for the bottom edge. Today I'm shortening those lined slacks from last week. The outer layer is shortened exactly the same as unlined slacks. 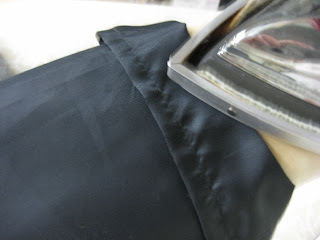 The slacks I have today are a little higher quality, and actually have hem tape at the edge of the hem. This takes the place of serging. It's an extra step to rip this off at the beginning, and I reattach it after cutting.Since the hem doesn't need to be serged after cutting, though, the time factor is about the same. I never mark the lining. 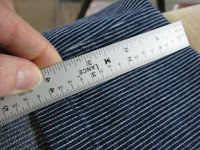 I fold it up while it's on the sleeve board, measure the amount to shorten, and ½" for good measure, and just press into place. After that I cut off the excess, leaving 1" hem allowance. I can then fold that in half to create the double hem, press and sew. Hopefully the pictures will illustrate this. Today was spent finishing some hems and repairing holes in sweaters. 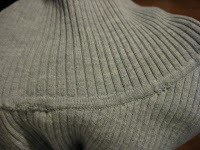 The sweaters are the lightweight ribbed kind with a turtleneck. If a customer requests that I repair a hole where the neckline has separated from the collar area, I will do this, but I warn that it will never look the same as it did when it was new. No matter how much care I take, I can never make this blend well, because the original seam has been knitted together, not sewn. The best I can do is use an exact color match in the thread, then pull the loose loops together. It takes a long time to catch all of those loose threads, too. If this knitting comes apart in one of my own sweaters, I give it away! It will always look repaired. Take a look at the photo to see what I mean. I have 5 pairs of slacks to shorten today. One pair is lined, all are ladies' dress pants. Then I make some tea to heat up my insides! 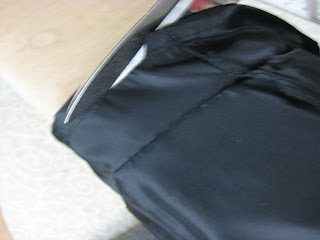 Next I remove the existing hem stitching. 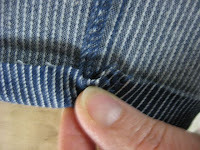 If you know where to grab, you can get the whole hem stitch to come out in one piece, and it takes about 3 seconds. I can post a tip about this later. After that, I mark all the hems using tailor's chalk. 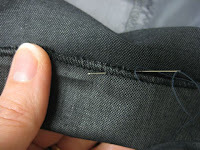 You can do this while the hem is still folded up, even though it is no longer stitched. You get an accurate measurement this way. I place the pants on a sleeve board. It makes the job much easier. 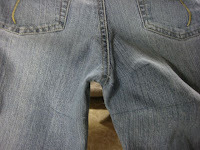 Tailor's chalk will disappear if it is heated, so unless I want to remark these pants, I use care on this next step. I am pressing the existing hem allowance flat, so I can mark the new one. Sometimes I can eliminate this step, especially if the pants need to be shortened more than an inch and a half. When that is done and the pants have cooled, it is OK for me to mark the new cutting line, 1¼" from the new hemline that I drew earlier. That is where I cut. Almost there, I fold the new hem on the first line that I drew, and press well. From the outside, the hem should look finished. I'm used to doing this with the pants right side out, but inside out may work better for you. 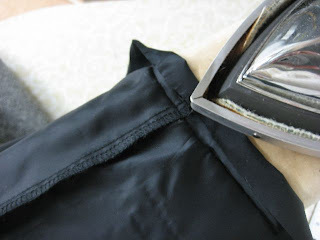 I take the pants to the serger and serge the raw edges along the cutting line. Yes, I could have saved a step here and used the serger to cut on the cutting line. I like the accuracy of cutting first. You need to press again so the threads have a memory of where they want to stay, and the serger threads lie flat. Now I hand sew the hem, using a small stitch, and the slacks are done! If I have a lot of hand sewing to do, I can sit in front of the TV, or do this work while waiting for a doctor or a carpool. I like this portable part of my job because it fits in well with my lifestyle. Tomorrow I will tackle the lined slacks. Today begins this blog about what I am altering. I'll be explaining the garments I am working on and giving advice if you're trying to alter something yourself. Come watch me work! I plan to shorten several pairs of slacks tomorrow, one is lined. I also will do some mending. I'll post pictures of most of these projects.